RMHCA is excited to announce a new award this year: The Kitchen King/Queen Award. 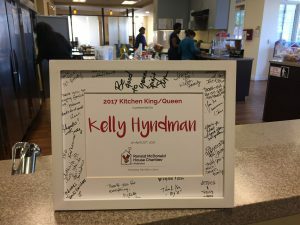 Since one of our roles is Kitchen Coordinator, we wanted to highlight one of these volunteers for their work in helping keep our kitchen neat and orderly. Kelly Hyndman has been volunteering bi-weekly for the past two years. She assists with preparing and setting out meals when the meal group is not present, cleaning the kitchen, storing leftovers, and more. Kelly says these jobs may seem simple but she has seen the big, positive impact it has on the families at RMHCA. Kelly says when she first came to Birmingham, she drove by RMHCA each day on the way to work. She says she wanted to feel connected to the community and decided to become a volunteer. “I went to RMHCA orientation and felt this was a great volunteer opportunity that I could easily incorporate into my weekly routine. 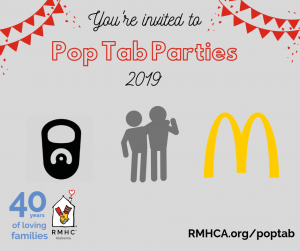 I have enjoyed being part of the RMHCA family ever since,” she said. Kelly does so much to help keep our kitchen a beautiful space for our families to gather and enjoy. Thank you, Kelly!